Select your favorite color and pattern from our collection. Once you decide the design, our professionals will visit your place and take measurements of the walls. We come and install the wallpaper on your walls. Is it time for that old and faded wallpaper to go? Removing wallpaper can be tricky without the proper tools and relevant experience. 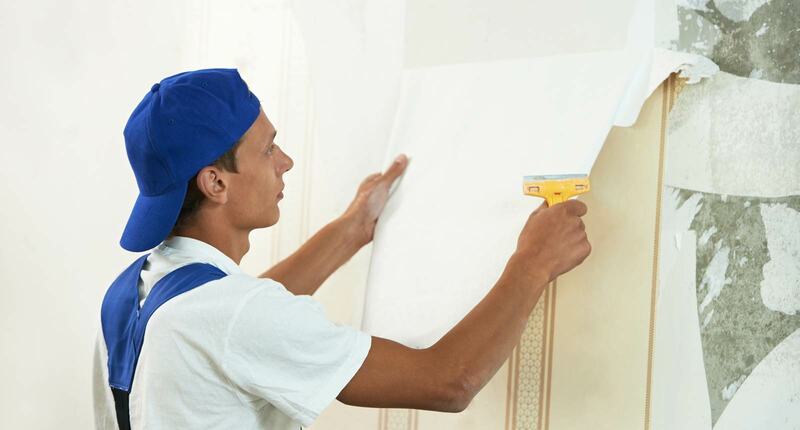 At DecorBayt our teams have years of experience removing wallpaper for all types of projects, from small residential jobs to large commercial jobs. We know all the tricks of the trade and can get the job done fast. For the best experience, that is, for the installation to be completely smooth and crease-free, workers need to be experienced, which is exactly what we promise you. Our crews have been at this for years, which is why we can commit to a process that is not only quick, but also ultra-smooth and beautiful. If you don’t have the right equipment or training wallpaper removal in Dubai can be a slow and arduous task. Our crews’ knowledge and experience combined with professional grade equipment enables us to remove wallpaper quickly and effectively. We make sure your walls are scrapped completely clean, so that you can move on to the next step of the process. Additionally we can repair any cracks or damage to your walls that may have been hidden underneath the wallpaper. Once the walls are ready to go, we can start painting or installing new wallpaper.